The reason it resonates with me is that it applies to so many aspects of life — not just career advancement, starting a new business, or other obvious challenges in life. Possessing a certain degree of mental toughness helps you in everything. I also believe that having the ability to deflect rejection and not take it personally is one of the hallmarks of a successful, happy person. Let’s face it: If you perceive yourself as insecure, overly sensitive, and easily discouraged, there are a lot of careers, goals, and rewards that will be out of your reach. While it’s not the main topic of this blog post, a positive mental attitude is worth mentioning as a crucial ingredient to being a productive real estate agent. The ability to self motivate — especially in the face of temporary failure, setbacks, and discouragement — can make the difference between success and failure. As Winston Churchill is often quoted as saying: “Success consists of going from failure to failure without loss of enthusiasm.” That’s easier said than done, but if success was easy, then everyone would be doing it. I believe a positive attitude and an entrepreneurial mindset are among the two most important attributes that real estate agents need from the beginning. If there’s not at least an inkling of that state of mind to start out with, creating it from scratch would be an uphill battle. If a lack of motivation is a stumbling block to starting a career as a real estate agent or advancing in it, there are a lot of good books, videos, seminars, and audio programs that can help ignite your motivation and spur you on to a higher level of achievement. The first two that come to mind are Think and Grow Rich by Napoleon Hill, and The Greatest Salesman in the World by Og Mandino. As is the case with any self-help book, they’re worth reading, taking notes on, and then rereading on an as-needed basis. Other than a lack of self motivation and self belief, another key reason many real estate agents don’t achieve their potential — either financially or professionally — is because they’re trying to “reinvent the wheel”. Templates for Real Estate Marketing Flyers: This package of 53 professionally-designed real estate flyer templates are custom-made for real estate open house showings, exclusive listings, just listed properties, bank owned properties, short sales, new homes for sale, priced to sell properties, must see properties, and many other concepts, themes, designs, and slogans. Visit this site to view the variety of available real estate flyer templates* for real estate agents and Realtors. 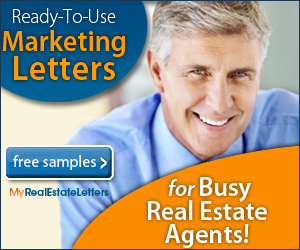 Thanks for checking out my latest blog post on real estate agent marketing ideas. Stay tuned for more real estate marketing tips and tools in the immediate future. *Disclaimer: Many of my blog posts that pertain to real estate marketing ideas, sales letter templates, real estate postcard marketing techniques, and marketing strategies for real estate agents feature links to websites, products, and services for which I am a compensated affiliate.